Here we go, the third event on my Super Volunteer series. I realy like this route it has a decent amount of climbing and has what I consider the most scenic segment of the regular San Francisco Randonneurs "main" events, Mtn House Road. The whole week before the event I went to bed early every night a little earlier so I would get used to sleeping early, something I don't normally do. By Friday evening I as in bed and lights were off by 9PM. When I woke up the next morning at 4:45 I did not feel tired, a good sign. Meet John P. and Tom H. at the Golden Gate Bridge Plaza and we moved a minute or two after 6AM. There was some fog but it was not supposed to rain while we were riding. I had printed an estimated schedule time table for finishing in ~20 hrs. We took it easy all the way to Fairfax were White Hill split us up a little but not enough to loose contact with each other. On the other side of the hill on San Geronimo Valley it was cold, really cold. On top of my base synthetic layer and a short sleeve jersey, I had opted for wearing my spanking brand new long sleeve "Colombia" jersey I had received a couple of days before, which was synthetic. Toping the three synthetic layers I was wearing a ripstop vest. My chest was nice and warm but my arms were freezing. I had brought my heavier neoprene booties but was not wearing them yet... My feet were really FREEZING! The cold continued though Nicasio where my bike computer read 0.51° C (~33° F) It was about two hours into the ride and it should be getting warmer anytime now right? It did not, at least not for a while. My riding partners were not as affected by the cold. By the time we got to the bottom of the next significant hill, Hicks Mtn I could not feel my toes. Shifted into a low gear to prepare for the next mile of climb and turned the pedals a few revolutions when I heard Tom behind saying something. I thought he had a flat but it was a little more than that. When I rolled down a few yards to see what was going on he had his non-drive crank arm in his hand! I thought, "ok lets screw that thing back in and we will be on our way" But the issue was a lot more complicated. The tip of the spindle had broken off and part of it was inside the crank arm. No way we could fix this on the spot. After a photo and few ideas of how to get to the closest bike shop, about 20 miles away and a few hills, Tom decided he was gonna try to pedal one leg to Point Reyes Station. It was 8:30AM and the first Control closed at 12:48PM. It would take a very strong ride to Pt Reyes Station a very fast fix there and then ride back to rejoin the course to get to the Control in time. We wished Tom best luck and John and I moved on. We got to the Bodega a little before 10:30AM, got a quick drink and I was ready to go. I asked John if he wanted me to wait for him, "no go ahead, you have a triple, you probably will climb slower" We were referring to Joy Rd, that steepish longish climb ahead of us. I climbed at a pace that felt good and kept looking back for John but he never caught up. I continue alone all the way to the next control in the Safeway at Guernville. While I was looking my bike outside the store John showed up. He was in an "all business" mood, "just a quick stop". It was 11:35ish. I asked if we were gonna get a six pack of Ensure and share it as we did on the 300k a few weeks before. "No, I am gonna use this all" ok... glad I had brought 4 Ensure bottles myself. I went inside and got soup and a Snickers bar and was done by the time he came out. We left together and were now headed for Healdsburg, at least the west side of town. Nice temps now. The next couple of hills were ahead, Hwy 128 and Mtn House Rd the most scenic part of this ride. The light traffic followed us and we had plenty of opportunity take in all that scenery. Mtn House Rd was very pretty as always and this time the last few miles before Hopland went by very fast. we were there at 4pm. I went straight for a slice of pizza and was seated and eating in no time. John got stuck after a few customers who got the last pizza slices and had to wait a little bit for his. When I was done I went out to check if my seat post had slipped as I felt I was too low on the bike. It was all fine. I took the opportunity to reinstall the lights I had taken off the bike back in Guernville and then after John finished his food we left. It was not a short stop by any means but we were still on schedule for a ~20 hr finish and we were not pushing hard at all. Almost every time I've done this route I stop at the store in Geyserville but not today. Hwy 128 has a little traffic but not much more than other times; however police was patrolling the road and we saw, in separate locations, cars with hispanic couples being stopped. Coincidence or racial profiling I don't know but I noticed it. I was feeling tired now and could not wait to get to make the turn towards Chalk Hill. We stopped a mile or two after the turn and put on some layers, it was getting colder. When we got to the top sunlight was almost gone, "let's put the night gear at the bottom" and we descended. I put on my clean, dry long sleeve wool jersey and then the ripstop vest and on top of that my reflective vest, yeah nice and cozy. The flat boring section to Petaluma had new pavement in many parts, we made good progress but the last 5 miles before Petaluma were loooong to me. John had the idea of stopping at Denny's in Petaluma. John: "just a quick stop 20-15 minutes max"
When Denny's was in sight I knew our stop would take a while. Got there and the waitress told us she had helped a small group of riders the weekend before. "Oh sure, they are also part of the thing we are doing. You may get more riders next weekend when the main event will be held." We both order the same, a milk shake, french fries and coffee. After 50 minutes (!) of warm comfy booth time I was getting anxious to finish. We were now about 20 minutes behind schedule. Went to Safeway to get our Control receipt and while I was done in a couple of minutes. John was a different story. He needed a little more time to put on his makeup and look pretty. I gave him a hard time and we rolled out for the last leg of out Volunteer ride. Another 10 minutes added to our already late schedule. The night was clear but the temperature was not supper cold as it can be on this ride at this point. Barely any traffic going up out of Petaluma. I was feeling fine and climbed just ahead of my friend and waited at the top before descending into Nicasio. Plenty of stars to see. From Nicasio to Fairfax there was more traffic but not a whole lot considering it was a Saturday. Somewhere past the town of Ross John got a flat. The 25 minute repair was the longest flat fix ever experience by any randonneur since Roman times. When he stopped inspecting the wheel/tire for the possible cause of the flat I grabbed it and saw one of the spoke holes in the inside of the rim was not covered by rim tape. We put a little bit of the same black duck tape I used a few years back when it was me who has a similar flat and eventually got the tire mounted, inflated and ready to go. On the Mill Valley bike path the last quarter moon was in full force. I call that "Half Moon." I did try to take a photo of it but my camera, I knew the shot wouldn't be usable. Still was a very nice moon. We climbed to the Golden Gate Bridge and were done at 2:55AM almost an hour behind my conservative estimate but it had been a nice ride. 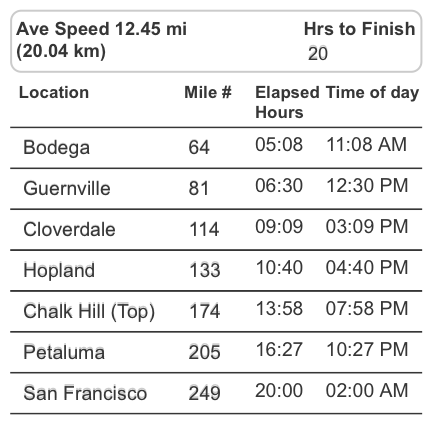 I was pleasantly surprised the San Francisco Randonneurs rider time calculator estimate was so much in agreement with the pace we had to complete the ride in ~20 hrs. If we had avoided the Denny's stop we could have finished much closer to the estimate. I recommend the tool to others looking for a way to gauge progress on a ride like this. One more ride to complete a "Super Volunteer Series". The Fort Bragg 600k.